Just buy. No Questions asked. Great sounding EQ, compares well to the hardware unit. Useful on everything. I love this EQ its just perfect on the Mixbuss, specially for cleaning the mids and adding air. I also love it on the piano with the M S feature to give a little bit of stereo spread. The best UAD 2 bus and mastering EQ, up to now. Pretty close to the Hardware. I really dig this one on the masterbuss but also on drums, guitars and vocals! Makes the sound even better on default mode without cutting or boosting a thing due to the accurate modelling of the whole circuit. Subtle but effective - light on the dsp and makes a real difference in the mix bus - also used it to widen synths - a great plugin all round - and used in every mix from now on!!!! Highly recommended!!! Much like other reviewers have mentioned, this EQ is really smooth. You can really shape the timbre of your mix without it sounding strange. This had replaced my goto Buss EQ ( Manley Massive Passive) at once. Congatulations - the first EQ Plugin that gives you a real sweet analog Sound. nice movement. and really warmth and sweet. i always using by master bus. The name is strange but this is a beautiful eq. I find that by using a subtle ammount it seems to give something to a track that perhaps otherwise would be missing. I love this eq. The most musical EQ to put on my master buss. The emulation is stunning. I used the hardware for years. Bravo! I bought this EQ because I knew the amazing sound of the hardware... I have to say that I was amazed with the sound quality of it and fits perfectly in my mixes leveraging them to a new level. Well done guys! This was one of the 3 pieces of hardware I wanted as a plugin format! Never heard the real thing, but every hit mixing engineer is using one. So it should be good, right? I never write reviews, but this is the best master bus eq I've ever heard. In combination with the shadow hills mastering compressor (the discrete) makes my master bus a super sounding, final chain! Try it and you will certainly buy it! very skeptical on this one...I mean really...another EQ? I have the Massive Passive. BUT, then I demo'd the Curve Bender and it blew me away - unbelievably super smooth, open. Indiv tracks, drum buss, mix... it's just amazing the way it opens up the sound. So, I guess the answer is, 'ME'... because I bought it and I love it. Had been thinking of getting the hardware version for a while. That thought is now on hold. 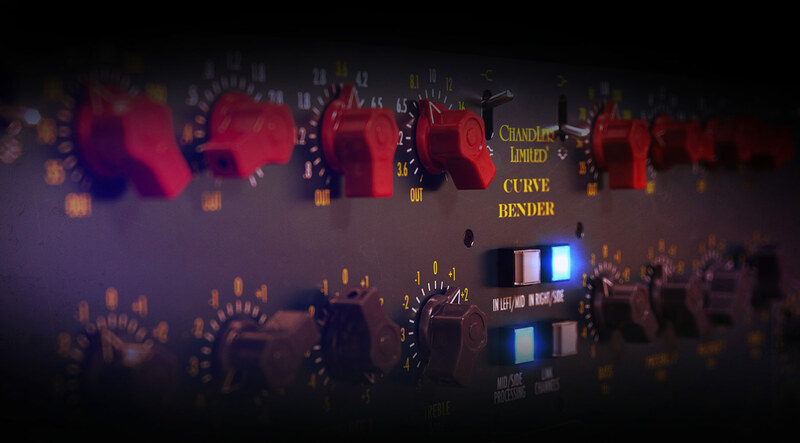 The Curve Bender Plug-In sounds every bit like i would have been expecting the hardware version to sound like. Thumbs up! I've wanted this in plugin form for YEARS. Having never been truly satisfied with the ITB Manley, MDW, Millenia and the like as a mix bus EQ finding them either boring, flat and uninspiring I honestly feel I can lay to rest the search. It's got an amazingly rich tone and musical EQ that you can boost for days and not feel like you're screwing anything up. Really happy with this, great job Softube! I don’t know the hardware but I like simplicity of this emulation and quality of sound! It also uses less dsp than some other mastering plugins, great sound, easy to use too! Defo on my master bus as a must be! Great! And boy do I accept them with open arms! What a wonderful piece of hardware turned software! Brilliant sonic and spacial characteristics! Lovely to use from guitar busses to master tracks. Absolute magic on a track.